For an hour facial I charge anywhere from $65- $80. Depending on skin type and specific skin care concerns I always include a facial mask. Not everyone has the time or budget to fit in a facial so today I am going to show you how you can incorporate a little spa treatment at home. Although I do not use this exact home recipe on my clients I DO use it on myself and I LOVE the results...Plus its only a fraction of the price you will pay at a spa. Yeay for YOU! 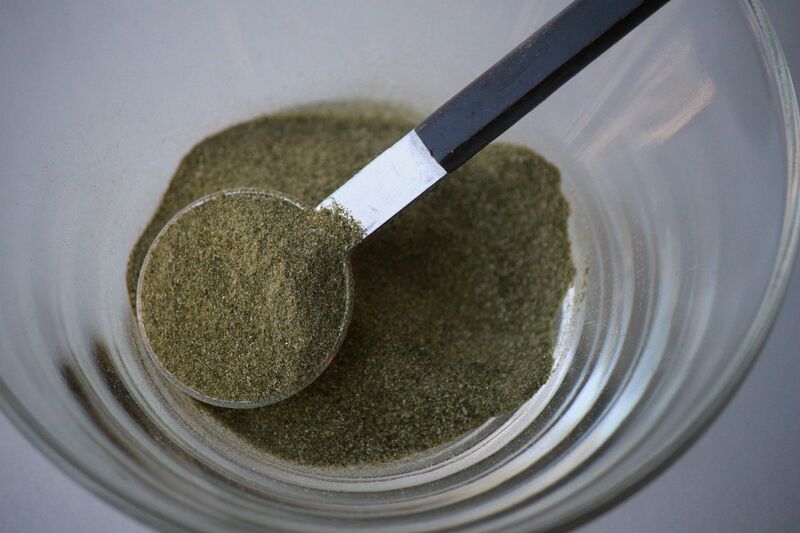 Kelp powder. You can find this at your local health food store in bulk. Aloe vera gel. I prefer to use aloe squeezed straight from the leaf to avoid any weird preservatives. 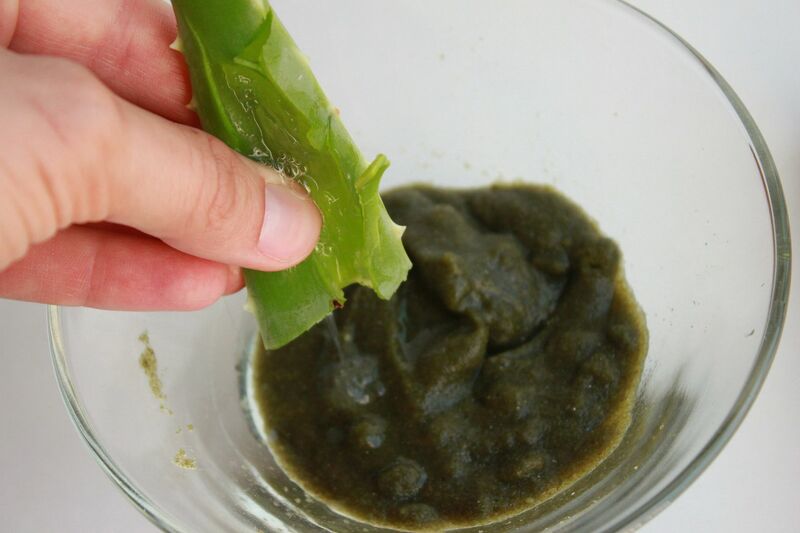 Mix 2 tablespoons of kelp powder with about 1 tablespoon of water. Mix until you have a paste. Add the juice from one aloe leaf. Apply to face and leave on for about 15-20 minutes. Remove with warm water and pat your face dry. Follow up with a moisturizer. If you have any questions regarding this you can leave them in the comment section and I will be happy to answer. If there is a specific topic or skin care concern that you would like to learn more about please let me know. You can mention it below or send me an email. I would love to hear your thoughts! Oh, that looks good enough to eat Lindsay! LOL I can't wait to try that. I'll get some next time I'm at the health food shop. Ahhhh...that looks so nice! I really want to try it. I just never make it to get the supplies! Great tip! Do you have to use distilled H2O or can you use regular tap water? AH I feel relaxed just reading this post! I love all of the skin care tips! I've been telling my friends about your blog and they all love it.. esp the skin care stuff! do you have any tips for reducing lines and little wrinkles? masks or moisturizers would be great! Anonymous- Thank you! Yes you want to make sure you use distilled water. Tap water has a lot of impurities in it that have not been removed. Jess- Thank you for such a nice comment! I will be doing a post on that soon..thanks for a great suggestion. Just remember to wear sunscreen everyday rain or shine and do not tan your face..that makes a big difference in preventing more or future damage to your skin. Fabulous idea and I could really use one right now. Now, do you have any DIY swedish massage recipes because I could one of those even more. Thanks for the tip...I'm always wondering though since I'm pregnant what is safe and what is not....I think I'm just overly paranoid! So this one would be fine to try right? This is so interesting! I think I might have to do this soon. Sounds like it would be awesome for my skin. I def wanna try this! Love the tip! Terrific, I've been wanting to make my own mask now for awhile. Marking for future reference! Thanks for sharing! I've actually been looking for a good face mask that I can make at home! I am so bad when it comes taking care of my skin the right way. I don't know exactly when I'm suppose to do facials or any of that. What's your suggestions as for a daily face routine? Wow thanks!! I was actually just about to get a facial... I definitely need it but it probably isn't part of my budget. I'll be trying this out! Um...wow! Thanks for this - totally awesome! Holy smokes! I have a good feeling that my skin would love this (however I don't really care for seaweed myself!). Thank you for the sweet comment! I wish my jewelry shop was open now, but hopefully very soon! Thanks for the visit though! Is it possible to follow your blog through GFC? I love your blog! Great tips, yet again! I love reading about your skin care tips! Your skin glows so beautifully! Great recipe! Thanks for sharing something we can all re-create at home. I will definitely be adding this to my natural skin care regime! This is awesome! I'm going to pin this! This is -so- cool! I definitely need to mix up a batch and try it out. Seriously! I never knew! Need to try this! oh, I will have to try this!! Thanks for sharing. I've read so many positive things about plants from the ocean/sea. Not just to use as cosmetics, but to eat, too. Thanks for sharing this mask. I definitely need to include more seaweed, kelp, etc. into my life! Thanks for sharing,sound great. Not sure if I can find kelp powder in Malaysia. I was really excited when I saw this post and decided to try it out! I found trhe kelp powder (even though it looks different than your picture shows)at my local bulk foods store. While my face is super super soft now, I found the smell to be really nasty! I'm sure I will try it again, but not anytime soon ;) Thanks for sharing! Sam- So funny but I actually JUST bought a little ear coning kit last week!! It has been sitting on my bathroom counter because I am so scared to use it ha! Once I get the courage to try it I will possibly do a post on it. I have heard so many wonderful things about it though. yay! please let me know how you like it! i want to do it so badly. where did you get your kit? Including seaweed in your diet on a regular basis can reduce FIBROID growth in women and help manage blood pressure. I cannot believe that I can now make my own seaweed mask at home. This is more preferable than receiving this treatment from a spa. Question; How often can a seaweed mask be used? weekly? Every other day? Old post I know, but i saw a recent 2013 comment. A study at a university in japan had women put a similiar mask on their face, twice a day (for 5 minutes a day, i think) for six weeks. They claim it stimulated collagen production and thus the women had a less wrinkles. I've been doing it everyday and will try for 6 weeks. I'll let you kn the results. So far though ( a week into it) my skin looks and feel fabulous. Will this mask help soothe papules from Grover's disease? I'm very desperate for help and relief. I've had this rash for nearly 4 months and just got a biopsy that reported "consistent with Grover's". My derm (3rd one) told me to try tretinoin cream to help smooth out the bumps, but I want to stay natural. Any suggestions would be so greatly appreciated. Hi, thanks for the great tips. Can I make it ready and store in the fridge or I have to mix it every time as needed? I have a friend, she got a fresh seaweed mask from one of the spa. Since it's fresh, she doesn't need to mix with anything but just store in the fridge. When she needs to apply the mask on, she just take it out from the fridge and then store it again. So I was wondering if I can mix the whole jar and store in the fridge vs mix it everyday. Thanks. It is very helpful and informative article. Thanks for sharing your experience with us!! I am using Sakare products, because it really helps to moisturize my skin. I like diy facial mask and now using facial mask with oatmeal, egg and apple. The recipe is very easy and effective. Ingredients: Apple, Egg Yolk, Oatmeal. Blend these 3 ingredients well. Spread the mixture all over your face. Let the mixture stay for about 20-30 minutes. Rinse it off with pure water. That's all. You can try this recipe.